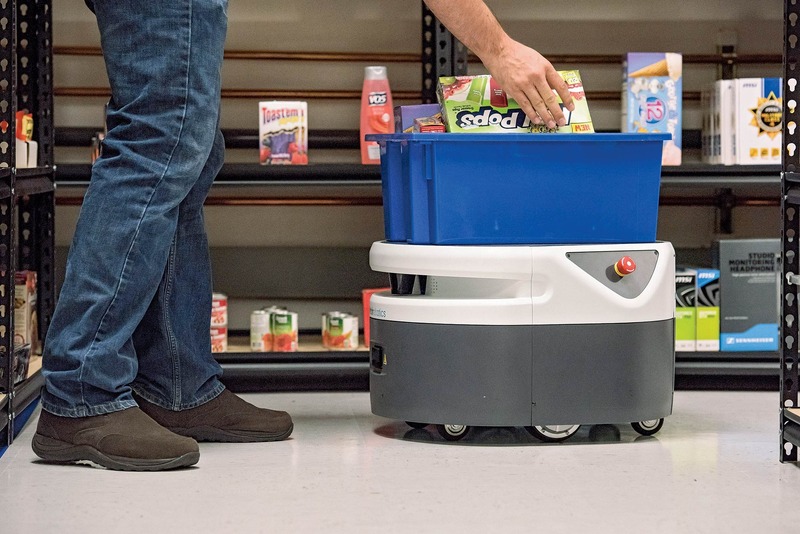 In Fetch Robotic’s mock warehouse, stocked with granola bars, breakfast cereal, sponges, and other household goods, a worker plucks items from shelves and places them in a plastic bin. The bin is set atop a small wheeled robot that follows the employee’s every step like a puppy. When the container is full, the robot darts off with it to a packing area; a second robot with an empty bin then picks up where the first left off, allowing the worker to keep gathering items without pausing or having to push around a heavy cart. Fetch Robotics, reports BusinessWeek (Oct.26-Nov. 1, 2015), is one of a handful of startups working on warehouse robots aimed specifically at e-commerce companies. As with most things in the world of online retail, Fetch exists because of something Amazon.com did. In 2012, Amazon paid $775 million for warehouse robot maker Kiva Systems; shortly after, it stopped Kiva from selling its machines to anyone else. “When Amazon drops nearly $1 billion on something just to keep it out of the hands of competitors, it sends a really strong message to the market,” says an industry analyst. With a goal of plugging that hole, Fetch says its robots can keep up with a briskly walking person for 8 hours on a fully charged battery. It has just started selling its robots, for $25,000 apiece, and is considering renting them for $4 an hour–meaning the full purchase price should pay for itself in 6 months. The cost of greater automation, of course, is fewer jobs. But the rise of online shopping created one of the relative bright spots in the U.S. job market: The warehousing industry employed 778,000 people in September, up 22% from 5 years earlier. For now, the Fetch robots are meant to be mechanical pack mules, supplementing humans who have the vision and dexterity to quickly recognize and retrieve the desired products. Fetch, however, is developing a robot with cameras and clawed arms that it says will eventually be able to grab items from the shelves, too.